These journeys were channeled by a Consciousness Clearer specifically for Consciousness Clearers. They guide you through ceremonies of initiation in which you utilize light and energy to transform your role as a Consciousness Clearer in the world, and consciously establish a higher paradigm for making your contributions more joyfully. As you know, it can be remarkably challenging to function as a Consciousness Clearer in the world. This is an opportunity to make your path more joyful and nurturing for you. Instead of struggling with, complaining about, and being chewed up by this path, these guided journeys support you in transforming what it is to be on your path. You can consciously use these journeys to practice attuning your energy to the new paradigm, and "hang out" in that more enlightened energy setup - you can develop greater stability in wearing the energy of the new paradigm. That is mastery on your part; it will establish your shifts more quickly. I know; you've done enough inner work to shift twenty people, and you're not interested in more processing. You just want life to be different, and you want it different now. I know the feeling. The good news is that you really can shift what it is to be on this path by working with these journeys. That's probably more than we can say for your previous efforts to get life to be different. You can use these journeys to join in group synergy with other Consciousness Clearers (who have also worked with these journeys), to align your Intention to shift this path. By joining in synergy with other Bodhisattvas (Consciousness Clearers), your power is amplified exponentially. You can use this Group Synergy to more powerfully create shifts within yourself, and in the path itself. This is a powerful way to establish your pattern and train your energy to let your true contribution come through. Don't just wish and hope that somehow your path gets better; don't merely endure the difficulties of being on this path! Set yourself up to more gracefully and joyfully make your contribution here. The following journeys come with a .pdf document of notes and coaching for doing the journeys. This document provides insights and clarity for shifting your mode of functioning here, as well as valuable distinctions for working with light and energy to shift your path, and for utilizing the expanded power of group synergy. This twenty-some page “Coaching For the Bodhisattva Journeys” will be a kind of “hand-holding” and step by step coaching to help you get the most from the journeys. 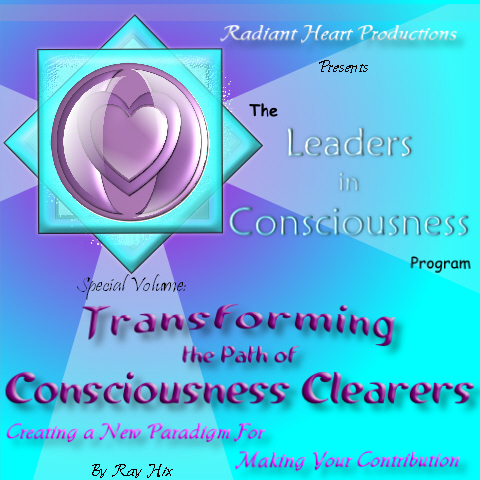 Together, this document and the guided journeys will help you shift into a new paradigm of functioning as a Consciousness Clearer, so that you can make your contributions in ways that are much more nurturing for you. Section One: Ceremonies of Initiation The first three journeys will guide you through ceremonies of initiation, in which you will work with light, energy and spirit to officially complete the "breakdown phase" of your path as a Consciousness Clearer. The journey will set you up to find the energy of your previous creation, your path of the Bodhisattva in this lifetime. As you re-experience yourself as the creator and chooser of your path, expand beyond your creation, and as Source of it, declare your path open to shift. You will be set up to ask questions of your soul regarding your role on this path and how to most optimally transform your path. In this journey we will be assisted by some very high beings of light. These are not lower-level astral entities; they are from highly evolved dimensions of consciousness. They will utilize an energy filter, like a sieve, that you can use to cleanse your energy field, and leave behind anything of the old paradigm that you no longer want to carry with you. And then with support from the higher realms, we will transmit the frequencies of the new paradigm into your physical reality. Use this journey to transmit and harmonize with the collective consciousness of humanity, and align them with your new path so they can receive and allow your shift, without feeling threatened by you, or needing to hold you back. Section Two: Stabilizing in the New Energy The following five journeys provide you with more opportunities to play in and resonate with the energy of your new path, your new mode of functioning that is more joyful and nurturing to you. These journeys help you discover, embrace, and live from the new, enlightened paradigm for making your contribution in the earth plane. Enjoy them as a fun way to submerse yourself in the new energies. Expand yourself as a flow being, into the larger universe where the shifts and openings that are next for you, already exist, and are already well developed. Open your entire being to align with this higher creation. Allow the master light beings to play notes for you to vibrate with: Grace; Flow, Effortlessness; Joy; Abundance; Perfect Timing; Fulfillment, Well-Being; Appreciation and Gratitude; and the ability to open. Awaken your ability to "vibrate at fulfillment." Direct those qualities into your personality. As you bring these qualities into your personality, you become an active force in causing your new paradigm to show up. Expand your consciousness to connect with the Universal Mind, allowing Divine Intelligence to flow through you. Allow the experience of effortless grace, surrendering to the experience of being played by the higher forces of the universe. Bring this energy of flow, grace, and fluidity to a specific area of your life. Tune in to the energies of those in your soul group, the ones who are working on the same shifts as you are. Explore and acclimate to the light, forming and dissolving in the light, creating a critical mass with your group. Allow yourself to be carried on the energy of these shifts, as all of you as a group are opening your earth plane existence to this level of flow. Align with your group in demonstrating patterns of Joy to humanity. Tune in to the energy of the masters from the higher dimensions, and feel and resonate with their ability to function as Generating Principles. The masters transmit the quality of steadiness to you, to let life be effortless, to flow and be carried along your highest path -- and to be comfortable with the experience of expanding possibilities for yourself and for others. Use this journey to consciously blend energies from the higher realm with those from your earth existence. Align your heart with the soul of the earth and the light from the higher dimensions. Experience yourself as a Generating Principle, and call forth the experience of Grace from different perspectives. Transmit the quality of Grace into the source of your physical body. Become the energy of "being carried" into these new shifts, as you coast upon Grace. Connect with the grid work of light workers who are able to play at this vibration, as the Great Being connects with your heart, and transmits to you the clarity and knowing of how to manifest in this dimension at this time. Receive a special transmission of trust. Use this journey to experience the feeling of being carried into the new paradigm. This journey provides you several ways to get insights and coaching to help you step into your next shifts more optimally. This is an opportunity for you to both practice learning these qualities for yourself, and to contribute them to the other light workers and Consciousness Clearers in the world. As you transmit your shifts to the similar souls on the gridwork of light, not only does their light increase, but yours as well. Bring this larger flow you've been experiencing into an area of your life, or your body, or your energy field. Use this journey to practice allowing your being to embody your new creation at more and more expanded levels, integrating it more and more completely throughout your being. Practice bringing in the qualities of rest, of well-being, of knowing that you can be carried, knowing that the energy structures are in place to support you in a much easier way. Practice allowing the new patterns to carry you, and to seep more completely into your earth life, to effortlessly bring you to your next steps on your path. This version of these journeys is for graduates of the Awakening Your Light Body program originated by DaBen and Orin. These journeys do not teach the light body centers, but refer to them. To avoid confusion and references to bizzarely-named energy centers you have not learned to work with, only order this version if you have completed the Awakening Your Light Body Program. The background music is by Michael Hammer. The "Creating a New Paradigm For Contribution" album of eight guided journeys is available either on four CDs or on four cassette tapes; both formats come in an attractive vinyl album. $60 per album, plus $4.90 for shipping. In addition to the eight journeys listed above in the "Special Edition For Light Body Students,"
The background music is by Michael Hammer. The "Creating a New Paradigm For Contribution Light Body Graduate Edition" Double Album of sixteen journeys is available either on eight cassette tapes in an attractive vinyl album, or on eight CDs. $100 per album, plus $6.00 for shipping.